Their ad reads, "SentForever transmits your personal message into deep space. Once that message starts traveling, it will continue for an eternity. If you've ever wanted to give someone special a personal and very unique gift, why not send them a message that will last forever." The way it works is, you write your personal message and submit it to their website. 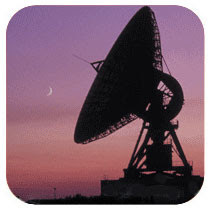 Then they transmit the message into space via a large radio telescope. They send a certificate to the person you want to dedicate or send the message to, along with a personal tracking number so you can track how far the message has traveled into deep space. You can also receive e-mail updates to find-out when your message passes key milestones if you want. This service normally costs £9.95 (approximately 20 US Dollars). Right now they are offering free messages, so I tried it out just so see how it works and what you get for your money. This message from Mike Simonsen was transmitted into deep space on 20 February 2009 at 04:47 UK time. Going at the speed of light, your message has traveled 37,639,662,291 miles to date. I'm usually not in favor of doing stuff like this. I really have a problem with the companies that sell 'name a star' services. If you've ever had the uncomfortable experience of someone coming up to you at an observatory open house and asking to see 'the star named after my dear departed Aunt Mary', you know why. It's a scam, and one that can hurt people when they are told some anonymous star with an obscure catalog name can not really be named after Aunt Mary, no matter how much money they plunk down. Then there are the people who sell real estate on the Moon or Mars. If this is done in good faith and humor as a fundraising tool for a non-profit, fine. But if it's done to make a profit off of gullible, uninformed people, I think they should be jailed. This service though, is something different. These people actually can send a message into space that will travel forever. Sending a message that is verified electronically to a loved one as a gift or Valentine's Day card doesn't hurt anyone. I can see how this could be used to demonstrate the scale of the solar system, our immediate stellar surroundings and the scale of the universe. How many miles are in a light year? How long will our message take to get to Pluto? How long to catch up to the Voyager spacecraft? How long to get to the nearest stars? And if you're going to send it to your wife, you might want to make your message a little more romantic than mine. Admittedly, I was trying to think of what it is I'd actually want to hear if I picked up a signal from deep space. Confirmation of alien intelligence, for sure!! Now I may have to spring for the twenty bucks to send something romantic. Your blog is really interesting ! Thanks, I try to make it fun, but keep the science real. unfortunetly, they ended their service, there is one more of the same service.